Don’t let your friends drive drunk. Take their keys away if you must. Pay attention to your surroundings. They don’t have to be friends for you to be concerned; you can also try to keep a complete stranger from driving after drinking. Before going out, choose a designated driver – someone who will not be drinking alcohol. Call a friend, relative, or taxi to pick you up if you’ve been drinking. Needless to say, alcohol consumption is a very serious subject and in many cases has very serious repercussions. 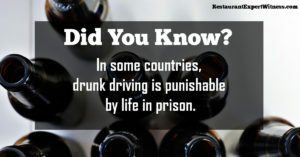 Sharing this information and reminding them of the importance of responsible alcohol service and consumption could make a huge difference. You can find more information about responsible alcohol service and more from Restaurant OSHA Safety and Security. You can purchase a copy of the book and download a free sample HERE. To find out more information about Howard Cannon and the expert witness services he provides, click HERE. If you have a media inquiry for Restaurant Expert Witness – Howard Cannon, visit our Media Page HERE.